Pluto will have an energy that is indirect. However, the outcome of his energy will hit hard. The planet is about complete change, conversion, and renewal. Pluto might not get things done in a neat way, but he gets them done. He does not take his time with change. Pluto will want the people he rules over to be ready for change. However, if they are not, Pluto will not mind letting them have misery. Pluto will want people to go beyond what they know. He will want people to feel like they are being redeemed. Because of this, the planet will feel like the people will be stronger. Pluto will construct a lot of things. He also controls the reproductive system. However, Pluto will enjoy destroying things. The planet controls elimination and death. Pluto is concerned with infatuation and abduction. Pluto uses compulsion, misuse, and ailments. He will rule over organized crime and criminal elements. He will control rebellious activities. Pluto will be concerned with secrets and things that are hidden. Pluto will be concerned with power of different things. He is passionate. His energy will be concentrated on the majority of people and what they will do. Pluto will want people to look inside to their subconscious to see what they are about. The planet will not care if the people are afraid. He knows how to push people. Pluto will take about 248 years to orbit the zodiac. He can spend anywhere from 12 to 31 years with a sign. The planet will rule over Scorpio and the Eighth House. Pluto is the last planet in the transcendental collection. He is in the octave above Mars. Pluto was the god of the underworld in Roman mythology. He rules over Scorpio. He has energy that is responsible for change. The planet symbolizes forces that are subconscious. Pluto will be concerned with things that are hidden. Pluto will have positive traits of regeneration and rebirth. He symbolizes the end of things and new beginnings. He can represent spiritual development. Pluto can have negative traits of being obsessed with power and control and typically destruction. 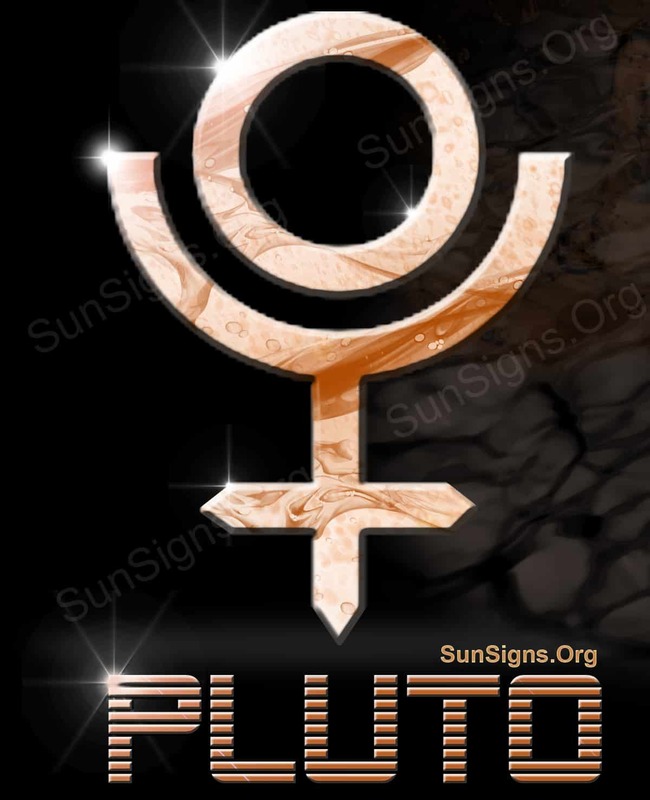 Pluto will rule over areas of life that are connected with disruption, transforming, issues with control, and power struggles. Pluto’s symbol is made up of the circle that symbolizes spirit, the crescent that symbolizes receptivity, and the cross that represents matter. The symbol will be about spiritual receptivity and things that are above the physical world. Pluto had an older symbol of the letters P and L being put together to symbolize the person who discovered the planet. His name was Percival Lowell. However, the symbol is not typically used in modern times. The planet Pluto will represent deep psyche and hidden power. He symbolizes elimination, infatuation, and being distant. He represents regeneration, transforming, and thinking. He symbolizes rebirth, discovery, and shadows. Pluto will be responsible for people having an epiphany after they have been stuck for a long time. Pluto will be concerned with being distant, mysterious, and hidden.